The Durban University of Technology (DUT) prides itself in developing quality emergency care graduates through excellence in community engagement. Emergency Care Providers are responsible for providing pre – hospital advanced life support and rescue services to critically ill or injured patients. This involves gaining access to the patient, often in hostile environments, providing emergency medical care and stabilisation in the field, and ensuring their transportation to medical facilities for definitive care and onward management. With these core factors in mind, on 21 January 2019, 17 second-year students from the Department of Emergency Medical Care and Rescue (EMC&R), along with Head of Department Dr Simpiwe Sobuwa, lecturer Amy Lagesse and Keanan Reynolds (WS&R) coordinator, undertook this year’s Wilderness Search and Rescue (WS&R) hike, which forms part of their module where they would spend five days in the Injusuthi region of the Drakensberg Mountains. Injisuthi lies in the central part of the Maloti-Drakensberg Park World Heritage Site. Lithobolong Peak is the seventh – highest mountain in South Africa, it is located in Injisuthi near Red Wall Peak. According to Lagesse, the aim of the exercise was to refine their search and medical rescue skills for the wilderness setting. Prior to being deployed on the hike, the students underwent rigorous physical and injury prevention training as well as lectures pertaining to self – care in the wilderness, treating of patients in a resource limited environment, navigation, search strategies for a lost person and how to conduct a rescue in severe environments. According to Asabulela Nonganji, this was a life-changing experience. “Not only did I learn technical skills necessary to rescue injured and stranded patients in serious environments, without me knowing I learnt team work, how to survive with very little food and water for days, how to use maps, and compasses, and most of all – how in that freezing cold and wet and isolated mountain – nothing else mattered – we were all equals – just hoping to survive,” he said. 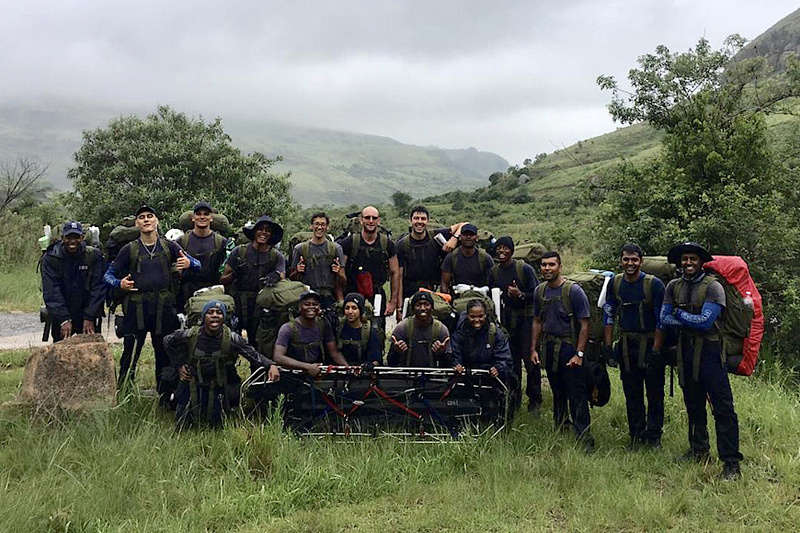 Head of Department – Dr Simpiwe Sobuwa, said: “The yearly wilderness search and rescue hike represents another example of the real life high fidelity training that our students are subjected to. This time around we spent five days in the Berg, the longest time compared to previous years and because we were embarking on a journey never attempted before I decided to accompany my students to ensure that they were safe and we had access to all resources possible; should the need arise. I must admit it proved really challenging but our students demonstrated that the training we had provided them through lectures and practicals in a controlled environment paid off in the end,” he said. He further added that he couldn’t be prouder as an HOD of the students and all the work put in by the lecturers at the department. Pictured: The Department of Emergency Medical Care and Rescue team in the Injusuthi region of the Drakensberg Mountains.